Habit: Annual to subshrub. Leaf: generally opposite proximally (or clustered in axils), generally +- fine-toothed; veins generally obscure. Inflorescence: generally raceme, bracted. Flower: radial or rarely +- bilateral; sepals 4, erect; petals 4, notched; stamens 8, anthers attached at middle, pollen grains generally shed in 4s, cream-yellow; ovary chambers 4, stigma generally club-like, occasionally 4-lobed. Fruit: straight, cylindric to club-like. Seed: generally in 1 row per chamber, generally with white, deciduous hair-tuft. Species In Genus: 165 species: worldwide except tropics. Etymology: (Greek: upon pod, from inferior ovary) Note: Incl Boisduvalia, Zauschneria. Most taxa polyploid; many with anthers +- = stigma self-pollinated; many hybrids. Taxa with alternate leaves moved to Chamerion. Habit: Perennial herb, erect, +- loosely clumped, with basal rosettes or fleshy shoot, generally strigose in lines, glandular distally, occasionally spreading-hairy. Leaf: 1--12 cm, narrowly lanceolate to ovate, fine-toothed; veins conspicuous; petiole 0--5(8) mm. Inflorescence: densely strigose, +- spreading-hairy, generally glandular. Flower: hypanthium 0.5--2.6 mm; sepals 2--7.5 mm; petals white to rose-purple; stamens <= pistil; stigma club- or head-like. Fruit: 15--100 mm, hairy; pedicel 0--15(40) mm. Seed: 0.8--1.6 mm, ridged, hair-tuft deciduous. Chromosomes: 2n=36. Habit: Plant 5--12(19) dm; rosettes well developed. Leaf: narrowly lanceolate, distal reduced. Inflorescence: openly branched, not leafy. Flower: petals 2--6(9) mm, white to pink. 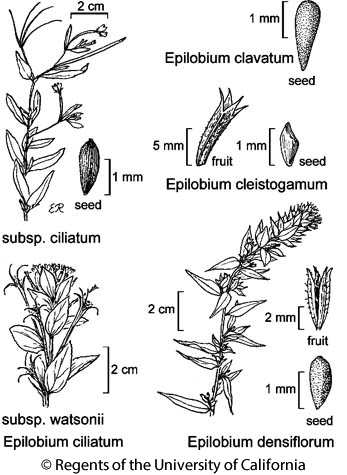 Citation for this treatment: Peter C. Hoch 2012, Epilobium ciliatum subsp. ciliatum, in Jepson Flora Project (eds.) Jepson eFlora, http://ucjeps.berkeley.edu/eflora/eflora_display.php?tid=50307, accessed on April 24, 2019. +- CA. Markers link to CCH specimen records. Yellow markers indicate records that may provide evidence for eFlora range revision or may have georeferencing or identification issues. Purple markers indicate specimens collected from a garden, greenhouse, or other non-wild location.